Only trail-tire with a radial design constructed for off-road use – Handmade in Germany. TKC 70 is positioned for 60% on-road and 40% off-road use. Unique tread block pattern makes the TKC 70 quiet and stable on the road while still providing good off-road capability. Currently at 4000 miles and holding up great on wear. Better in every way than the OEM Dunlops (that wore out in 3600 easy miles). These tires are fantastic and balanced easily. They were a real pain to mount. I installed the tires on a 2017 Honda CRF1000L Africa Twin. Highly recommended. New Purchase - Ready to roll. I just purchased this tire as a replacement for a Tourance. I like the tread pattern. I can't give much of a review till I put some miles on it, but wait till spring. Tire price was very competitive. Tire was build about 1 year ago, so no old stock here! Installed on my 2016 KLR 650. What a difference from stock. Quiet and more grip, especially on damp roads. However I do not recommend for mud or sand. I got myself into trouble with a full load and deep sand. All most went down. Not great in greasy mud either. This is my 3rd tkc70 rear. I've have never actually worn one out. The last 2 were replaced at about 12k, they could have easily gone a couple more but it's always nice to have fresh meat on the longer trips. They get great traction, handle and ride great. The front tends to start scalloping at about 3500 miles. The rear wears very even and seems to last about 5000 mi. which is good enough for this style of tire. It does not seem to be giving much up in the street department It can be leaned over to the edge of the tread confidently, and is aggressive enough for my kind of Adventure riding. Unlike other front tires I've had (on a KTM 1190AdventureR), this handling does not fall in to turns nor does it require effort rolling into a turn. 6K miles and so far no signs of cupping. This is a very good rear tire that expired at 7354 Miles. The fronts are not near as nimble as previous Michelins but the TKC 70 Rear worked very well and mileage was double previous Michelin. 75% of riding was done two up and fully loaded at 65-85 MPH.A little noisy for highway use but worth the sacrifice for the mileage. What I wouldn't give for another set of Michelin Anakee II. Anakee II lasted 12,00 miles on he rear and never failed to hold in the rain. Anakke II was best Adventure tire I ever had. Really like this tire. Much better than Anakee 3 and Tourance NEXT on dirt / gravel roads. More mileage than either on paved roads. No problems with front tire wearing unevenly like both of the above. This is my third set of TKC 70. Will buy again. Got these tires on just before the snow started to fly; luckily we have had a warm February to get some riding in. So far so good. Tires seem to grip well on wet sandy streets and overall feel is like the stock Metzlers. Rear balanced well but the front needed some extra weights to balance out. Have not gotten them off pavement yet since it's still winter but I think they will be just fine for mild off road. Only concern going in was possible road noise which isn't an really an issue; front whines a bit but nothing you notice through a helmet and wind noise. 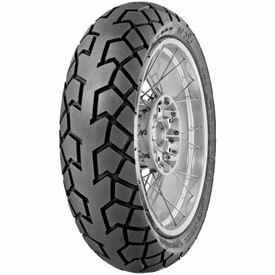 I've tried many brands of street oriented dual sport tires on my super tenere, the TKC70 have inspired the most confidence off road short of a full knobby tire and have had arguably the best longevity during long sections of pavement. I liked them so much, these are my second set! This will be my 3rd TCK70 rear tire. I average about 6,000 miles of useful life depending on the loads I am carrying. I run them on my 2015 KTM 1290sa and too much throttle can shorten the life pretty quickly so I am satisfied with 6,000 mile average. I have mated it with a TKC80 front as well as the TKC70. If the TCK80 wasn't so loud on pavement I would run that combination exclusively. The 70 front can get loud too, but not as much as the 80. I think the 80 front had better traction off road and didn't give up much on asphalt, besides the db. I have 2500 miles on the tires so far. Excellent handling in dirt, gravel and on the road. At interstate speeds the front tire has an odd feeling. Kinda squirms about. But seems to have gotten better after a few hundred miles. Front is starting to cup a little but otherwise nearly no tread wear. I would expect the front to last 10k miles as long as the cupping doesn't get too bad. Very soft compound on the sides of the tread with harder in the middle. The rear I expect to last at least 5k miles. These tires grip great on the road and ride very smoothly. Also fantastic on gravel and dirt roads. I Have an fjr 1300 . I like run fast on road . so spend time on gravel and off road conditions .. this type of tire looks like something I need .. I didn't want to spend that much . but If so I want it to last .would this work? 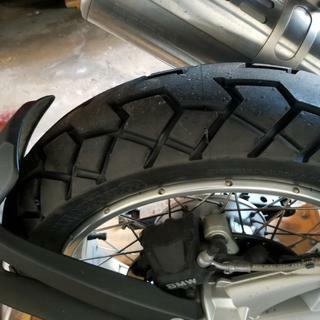 I used this tire in my R1200GSA and It lasted about 6000 miles, mostly pavement mil/ with occasional short gravel trips. The handling is concerning at first as there is a noticeable tendency to track on pavement grooves. The front tire develop severe cupping and became ver noisy. I am now using Avon Trailriders and I'm very happy with the way they handle on and off-road. Hey. I run this tires on super tenere. On pavement they are great. U can take sharp turns with no problem.The fastets i went with this tires was 115mph. On gravel they are good too.on my first set i did 15,000 miles. Mostly on pavement. As of now its my go to tires. With mix road and off road.now im on my 2nd set of them on my super tenere. If you do a lot of knee dragging on pavement, no, you won't like it - the tire trades durability & gravel capability for adhesion of the rubber. If you're more into touring or reasonable speeds in the twisties, yes, this tire is capable of decent twisty riding & is MUCH better than a street only tire on gravel, grass, dirt. Not a good choice for road bikes. I had mine on a KTM990 Adv. Great traction and stability on road but squared off really quickly. I've used TKC80 and expected more mileage from these due to the solid middle section. is a nice road tire that does OK off road. Sounds like you should have a GS! I think I got about 700 miles out of my first one. Just reordered another one. Excellent tire for every condition possible! Should get about 5,000 miles out of it! Ride a KTM 1190 Adventure R. Happy with this tire both on and off road.